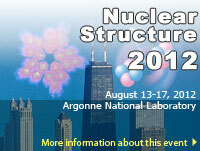 Argonne National Laboratory hosted the Conference “Nuclear Structure 2012” (NS12) on the campus of the laboratory, August 13-17, 2012. This was the 14th Conference in this series organized every two years by one of the North American National Laboratories. The Argonne National Laboratory nuclear data research program includes a variety of scientific activities carried out within the broader framework of the Coordinated Work Plan of the U.S. Nuclear Data Program. A significant portion of the effort is devoted to the compilation and evaluation of existing nuclear structure and decay, and nuclear reactions data. Some experimental measurements intended to improve the quality of the existing databases in specific areas, or to fill gaps as needed to generate reliable evaluations, are also performed. The program focuses on the manner in which nuclear data are used in science and engineering, and on development of new applications for nuclear data. There is a commitment in this program to compiling and evaluating data for various charged-particle induced nuclear reactions that are important in nuclear astrophysics and for nuclear structure, and decay data. The activities performed under the Argonne National Laboratory nuclear data research program are supported by the Office of Nuclear Physics, Office of Science, U.S. Department of Energy under contract number DE-AC02-06CH11357. Argonne National Laboratory is a U.S. Department of Energy laboratory managed by the UChicago Argonne, LLC.